These luxurious rooms offer spectacular views of the Pacific Ocean and front row seats to the evening's setting sun. Amenities include your own private balcony or patio, private bathroom with bathtub and shower, stocked mini-bars, and an intimate sitting area with sofa bed. Two double beds or one king (on request only). Central air conditioning, hairdryer, direct dial telephone, color satellite TV, Wi-Fi. Mexican styled guestrooms set on the bottom of the hill in the secluded and historic original area of the hotel looking out over spectacular views of the bay and the bustling marina. This section is not recommended for elderly and people with disabilities. King bed, air conditioning, balcony or terrace, luxury bathroom with shower, luxury linens, bathrobes, coffeemaker, in-room safe, body lotions and shower cap, mini-bar, iron and ironing board, clock radio with alarm, hairdryer, telephone, flat screen TV with satellite, Wi-Fi. Guest staying in these rooms have access to the Jacuzzi, set on a deck with fantastic view of the marina. All non-smoking rooms with tile floors, feature either two queen beds or one king size bed, stocked mini-bar, private bathroom with shower and hairdryer, central air conditioning, direct dial telephones, satellite color TV, iron and ironing board, free in room safe, Wi-Fi and private balcony with marina view. Set in the historic original part of the hotel, these rooms have sleek modern design along with access to a VIP pool area on a deck overlooking the bay and marina. Each has a sitting area and a private balcony with bay and marina views or partial ocean views, and King bed rooms have an in-room Jacuzzi tub. King bed with Jacuzzi or two double beds. Central air conditioning, hairdryer, direct dial telephone, color satellite TV, Wi-Fi, pillow menu, luxury linens, in-room safe, mini-bar, iron and ironing board, iPod docking station and bathrobes. Set in the historic original part of the hotel, these suites have sleek modern design along with access to a VIP pool area on a deck overlooking the bay and marina. Each has two bathrooms, a bedroom with a king bed and sitting area with sofa bed, a separate living room with two Murphy beds, and a private balcony with bay and marina views or partial ocean views. King bed with Jacuzzi and two Murphy beds. Central air conditioning, hairdryer, direct dial telephone, color satellite TV, Wi-Fi, pillow menu, luxury linens, in-room safe, mini-bar, iron and ironing board, iPod docking station and bathrobes. King bed, bedroom with separate living area and sofa, air conditioning, balcony or terrace, luxury bathroom with shower, Jacuzzi upon availability, luxury linens, bathrobes, pillow menu, coffeemaker, in-room safe, body lotions and shower cap, mini-bar, iron and ironing board, clock radio with alarm, hairdryer, telephone, flat screen TV with satellite and Wi-Fi. Guest staying in these rooms have access to the Jacuzzi, set on a deck with fantastic view of the marina. 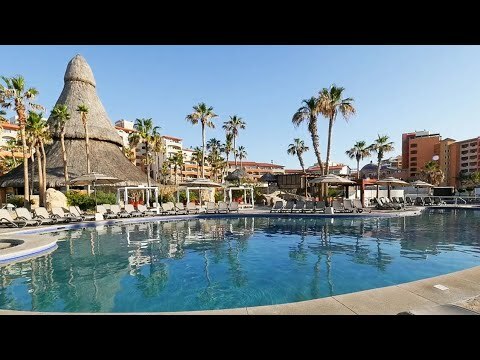 Hotel Sandos Finisterra is located at the tip of the Baja peninsula in Cabo San Lucas, Mexico, approximately 25 miles from the International Airport (SJD), with the Sea of Cortes to the East and the Pacific Ocean to the West. Perched on a hill overlooking the town of Cabo San Lucas, this hotel offers incredible views. 272 Rooms and suites, a secluded seven acre private beach and a critically acclaimed restaurant, among its many facilities. The name Finisterra means ``End of the Earth``, and that`s what you`ll find at this breathtaking all-inclusive resort. Sandos Finisterra is nestled on a clifftop at the very end of the Baja Peninsula. Situated just steps away from the excitement of Downtown Cabo San Lucas and the Marina, Sandos Finisterra has captivating views of the Pacific Ocean on one side and panoramic vistas of the city, bay and Marina on the other. Whether you`re looking to party through the night or lounge the day away, this resort offers the perfect vacation. Guests at Sandos Finisterra will find seven expansive acres of beach, perfect for serious seaside lounging. Although the ocean isn`t safe for swimming here, the beautiful beachside pool area has areas for games and relaxation, as well as seven Jacuzzi tubs and an adults only pool with swim-up bar. Kids Club, Open from 10:00 A.M. until 10:00 P.M. Ocean View Section: 180 Spacious Air Conditioned Guestrooms, Restyled with 300 Thread Count Bed Linens, Duvet, Satellite TV, Two Double Beds or one King Bed, and a Sofa Bed in all the Rooms. Hairdryer, Private Bathroom with Shower, Air Conditioning, Mini-Bar, Safe, Balcony/Terrace, Ocean View or Partial Ocean View, and Free Wi-Fi. Maximum Occupancy: Three Adults and Two Children, or Two Adults and Three Children. Deluxe Bay View Section: 20 Guestrooms with One King Bed or Two Queen Beds, Private Bathroom with a Shower, Hairdryer and Make-Up Mirror. Special Amenities: Bathrobe for each Adult to use at the Hotel, Shower Cap, Body Lotion, Safe, Air Conditioning, Satellite TV, Mini-Bar, Alarm Radio, Ceiling Fan, Coffee Maker, Iron and Ironing Board, Terrace or Balcony with Bay View. Maximum Occupancy: Two Adults and Two Children, or Three Adults. Finisterra Suites Section: 50 Luxurious Guestrooms Located in the Finisterra Suites Section, Set in the Historic Original Part of the Hotel with Spectacular Views of San Lucas Bay and the Marina, or Partial Views of the Pacific Ocean. King Guestrooms Come with a Soothing Jacuzzi Tub in the Room. This Exclusive Area of the Resort Provides Maximum Privacy, including Private Check-In and an Exclusive Pool Area, a Top Deck Overlooking the Bay that is only for Guests Staying in These Rooms. Finisterra Suite Amenities: One King Bed with Jacuzzi, or Two Double Beds, Sofa Bed, Bottle of Wine upon Arrival, Satellite TV, Digital Phone with iPod Dock, Alarm, Radio and Phone Chargers, Free Wi-Fi, Mini-Bar with Snacks (refilled once a day), 24-Hour Room Service, Hairdryer, Iron/Ironing Board, Bathrobes, Pillow Menu, 300-Thread Count Bed Linens and Sheets, Private Pool Area with Bar and Butler Service. Finisterra Casitas Bay View Section: 29 Mexico-Inspired Guestrooms Set Near the Bottom of the Hill in the Secluded and Original Part of the Hotel, with Gorgeous Views of the Bay and the Marina. The Finisterra Casita Deluxe and the Finisterra Casita Suites (separate bedroom and living areas) all Come with One King Bed. Guests Staying in this Section have Access to an Exclusive Jacuzzi Terrace with Marina Views. Casual dress code applies for dinner only in all restaurants. Bermuda shorts and men`s sandals allowed. No short shorts, swim trunks, flip flops, sleeveless shirts or sports clothing. Don Diego Restaurant: International Cuisine with Sleek Contemporary Style and a Large Outdoor Terrace with Clifftop Views of the City and Bay. Hours - Breakfast Buffet: 7:00 A.M. - 11:00 A.M. International Theme Buffet Dinner: 6:00 P.M. - 11:00 P.M.
Agave Restaurant: Poolside Restaurant under a Palapa Roof. Hours - Snacks: 10:30 A.M. - 5:30 P.M. Steakhouse Dinner: 6:00 P.M. - 11:00 P.M.
Pizzeria: Wood-Fired Oven Pizzas, Calzones and more in the Pool Area. Hours - Lunch: 12:30 P.M. - 4:00 P.M.
Tortuga Beach: Beachfront Dining in an Open-Air Setting. Hours - Dinner: 6:00 P.M. - 11:00 P.M.
Emiliano`s Osteria: Italian Cuisine. Hours - Dinner: 6:00 P.M. - 11:00 P.M.
Cupcake Cafe: Coffee Drinks, Sandwiches and Desserts with a Bay View Terrace. Hours - Open from 7:00 A.M. - 8:00 P.M.
La Palapa Bar: Swim-Up Bar in the Adults Only Pool. Hours - Open from 10:00 A.M. - 6:00 P.M.
VIP Pool Bar: Drink Service by the VIP Pool. Only for Finisterra Suites Guests. Hours - Open from 10:00 A.M. - 6:00 P.M.
Whale Watchers Bar: Clifftop Lounge and Adults Oriented Bar with a Terrace and Amazing Ocean View. Hours - Open from 4:00 P.M. - 10:00 P.M.
Plaza Finisterra: Clifftop Terrace with Bay Views and Fire Pits, Designed for Theme Nights, Live Entertainment and Events. The resort features three main pools in the beach area (including an adults only pool), as well as a clifftop VIP pool exclusively for Finisterra Suites Section Guests. Guests seeking on-site activities can enjoy both pre- and post-sunset tennis matches on two lighted tennis courts, or opt to sweat it out at the fully-equipped gym, complete with panoramic bay views. Spa Sandos has been carved right into the mountainside, featuring a blend of desert and mountain style with jaw-dropping views. Indulge in a dip in the hydrotherapy pools, relax in the sauna, rejuvenate with innovative body treatments, or order a soothing massage. Cabo San Lucas is the ideal destination for endless activities, like whale watching, snorkeling, fishing and desert tours. A golf course can be found just a 10-minute drive from the resort, and Los Cabos International airport is 45 minutes away. Los Cabos is known for sport fishing, diving, golf and water sports, but the ecological wonders of the Sea of Cortez and the Baja desert captivate visitors year round with whale migration during the winter months, superb diving during the spring and summer, the sea turtles that lay their eggs on our beach during the late summer, or the amazing catch and release sport fishing tournaments during the fall. In Los Cabos, there is something for everyone. No wonder Jacques Cousteau named our waters the largest living aquarium in the world during his many visits. Sandos Brand offers a Check-In App available for download. It can be found in App Stores.